Never has laser marking been so easy! Unpack the device, install the software, connect and get started. XENO 1 is a compact desktop system, offering little footprint and a large work area. XENO 1 perfectly fits with marking on metals or plastics. 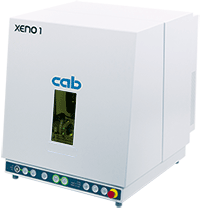 XENO 1 completes the range of cab laser marking systems in the lower price segment. Processing the system complies with high industrial standards. The marking plane is easily and quickly adjustable in height up to 200 mm with the motor-driven moveable Z-axis and the focus finder. In the case of graduated marking surfaces, the scan head is automatically tracked by software. Depending from the lens, the marking field has a size of 112 x 112 or 180 x 180 mm. It can be moved from the center to the right margin. The marking can be simulated with the pilot laser. Interior LED lighting allows observation of the workpiece when the operation door is closed. The workpiece holder is mounted on the groove plate. A rotary axis is available for cylindrical objects. The focus finder makes it easy to adjust the marking plane. The automatic operation door opens or closes within seconds. Material can be inserted manually or by a handling system from three sides. The extraction and filter system extracts pollutant particles, dusts or gaseous pollutants. It is provided as an accessory. With the comprehensive cabLase marking software layouts are graphically designed, markings controlled and processes monitored. The legal environmental regulations RoHS and REACH are observed. Never has laser marking been so easy! Sales director Mario Hiss highlights the benefits of XENO 1. Evaporation with high energy density removes the material. An indentation with a sharp outline occurs. is mainly applied with highly alloyed stainless steel as well as with titanium. The laser ablates the top layer to uncover the underneath material. Examples include anodized layers or paint coatings. is applied with plastics. The way the color changes depends from the chemical composition of the material as well as from ingredients and fillers. The laser melts into the surface of the material. What are the benefits of laser marking? cab Sales Director North Germany, answers our questions. XENO 1 is a fully equipped laser marking system offering high operating comfort for marking single components and series. As delivered, the device is configured with an IP address or in DHCP mode. Lenses with different marking fields are available. The smaller the marking field, the higher the resolution. It is mounted on the plano-spherical lens F-Theta and can be replaced in case of a damage. For marking on the circumference of a cylindrical workpiece. The latter can be clamped in the 3-jaw chuck. Laser marking processes produce poisonous dusts and gases. The extraction and filter device protects the health of the operators and prevents both the laser area and lens from contamination. At this, it also ensures that the laser power maintains. The air from the working area is extracted by a highly performant turbine via a flexible hose. The pollutants resp. dusts are separated by the pre-filter and the filter for suspended particles. Gaseous pollutants are absorbed by the active carbon filter. Cleaned air is then returned to the environment. The extraction and filter device has a modular design, filters are easy to exchange. It absorbs approx. 10 times more pollutant particles and dusts than the mat.